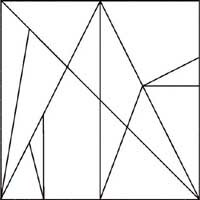 The loculus of Archimedes is a dissection game, similar to Tangrams, which consists of 14 polygonal shapes that fit together to make a square. These pieces can be rearranged to make pictures of people, animals, and objects, or reassembled into their original form. There are many references to the game in ancient literature, including a description by the Roman poet and statesman Magnus Ausonius (AD. 310–395). Only two fragmentary manuscripts, one an Arabic translation and the other a Greek manuscript dating from the tenth century discovered in Constantinople in 1899, connect the puzzle to Archimedes by calling it loculus Archimedius ('Archimedes's box'). More generally, but for unclear reasons, it is known as the ostomachion (Greek for stomach), or, in Latin texts, as the syntemachion.